January is zipping past so I want to look at how I did with meeting last years goals and set some new ones for 2010. 2009 was a year that was dominated by work and family priorities. I worked full time at Chatham University and I spent a lot of time caring for my elderly aunt. The time I usually spend on doll making and other artistic pursuits was spent earning my doctorate. I'll be done with that in April and then I will get to spend my pent up creative energy. I did OK with my 2009 goals, but I didn't achieve everything I wanted to do. I attended two doll-making conferences, the Artistic Figures in Cloth gathering in Columbus and the Enchanted Doll Artists in Albuquerque. It was so much fun to get away and enjoy the company of other doll makers. 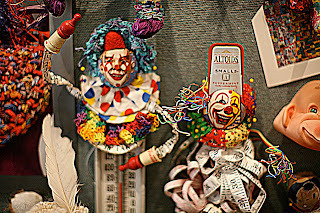 There are also wonderful doll makers in the Pittsburgh doll makers club, each member is inspired by a distinct muse and I like to watch their creative processes. Hosting and attending several meetings was a welcome break from my studies. It is especially nice when the members enjoy my cooking. Eight posts were made to this blog. 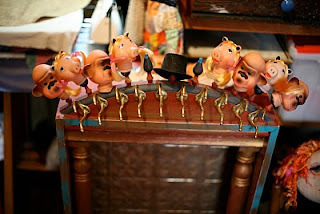 I had hoped to post more often but the posts that I did put up reflected my efforts to stay connected to doll making despite being really busy. Unfortunately, I didn't find a round robin doll exchange to participate in. But I did make and submit a doll to the Momiji competition. It felt great to meet the deadline and send a doll off into the world. Ruth Hendricks photographed some of my dolls. A couple of her photos accompany this post. It would have been nice to be more active in 2009 but I did what I was able to do. It is after all about fun and creativity. Participate in three days of workshops, classes or a doll making conference. Attend or host ten doll club meetings. Post at least twelve times in this blog. Submit photos of Baby Matron to a magazine. Submit the Stockinettes to a magazine. Have Roy Englebrecht photograph some of my dolls. Do "something" with the ribbons and awards I've been making. When the doctorate is over remove all journal articles, reference books and other related stuff from the studio. Start a new series of dolls.